Why See Boston Ballet - Rhapsody? The Boston Ballet's mixed-repertory program Rhapsody brings its stunning 2018/19 season to a rousing close. A no-holds barred exploration of the company's neo-classical and contemporary roots, Rhapsody ties together an exciting world premiere from a new voice in dance with a trio of works by Russian choreographer Leonid Yakobson and the Balanchine classic Tchaikovsky Piano Concerto No. 2 (Imperial Dance). Marking his choreographic debut at the Boston Opera House stage, principal dancer Paulo Arrais premieres his brand new work ELA, A Rhapsody in Blue. Set to the fizzing, jazzy energy of Gershwin's iconic score, the work examines the power of feminine energy with a cast of 15 men and one woman. This is followed by Pas de Quatre, Rodin and Vestris, three rebellious works by leading soviet-era dance figure Yakobson, whilst the evening closes with a resplendent piece by the Father of American Ballet. 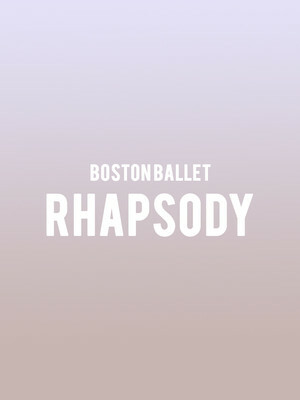 Seen Boston Ballet - Rhapsody? Loved it? Hated it? Sound good to you? Share this page on social media and let your friends know about Boston Ballet - Rhapsody at Citizens Bank Opera House. Please note: The term Citizens Bank Opera House and/or Boston Ballet - Rhapsody as well as all associated graphics, logos, and/or other trademarks, tradenames or copyrights are the property of the Citizens Bank Opera House and/or Boston Ballet - Rhapsody and are used herein for factual descriptive purposes only. We are in no way associated with or authorized by the Citizens Bank Opera House and/or Boston Ballet - Rhapsody and neither that entity nor any of its affiliates have licensed or endorsed us to sell tickets, goods and or services in conjunction with their events.